Scion is known for trying to be hip with the kids, but I have a feeling its latest concept, the Hako, is a couple steps too far, even for the spikey haired, angsty kids of America. Hako means box and this is very boxy, even more boxy than the xB. If you remember, Scion originally teased the Hako Coupe concept two weeks ago, but here she is in all of her ugly glory. Original speculation suggested that this could take the place of the xA, but something tells me that wouldn't fly too well. The Hako Coupe was designed by Scion's Tokyo design division and it was supposedly inspired by the emergence of American vintage style among young Japanese trendsetters. If this is American vintage, then I don't know if I want to be American. I'm sorry, Scion, this is a bit much. Oh and if you are wondering, on the rear, the right circle on the lower side is the exhaust, and the matching one on the left is the reverse light. Yes, very strange. This inside of the Hako Coupe is a bit more valid than the exterior. The inside is chock full of futuristic doodads including a trackball-like interface on the steering wheel. The passenger side has two LCD displays where media can be controlled. The backseat of the Hako also includes screens that are connected to video cameras placed on the outside of the Hako. Let the YouTube hoonage commence. March 19, 2008 - New York - Scion unveiled its Hako Coupe Concept vehicle at a press conference today at the New York International Auto Show. Scion's Hako Coupe was developed by Tokyo Design Division, which studied global, youth-inspired trends. Japanese and American youth cultures often influence each other and are interpreted with a unique twist. 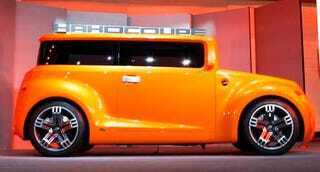 The Hako Coupe Concept was inspired by the iconic xB and the emergence of American vintage style among young Tokyo trendsetters. "Scion's Hako Coupe Concept embodies a distinct global perspective on today's youth," said Jack Hollis, Scion vice president. "This type of forward thinking complements the Scion philosophy of intently listening to our customers and being willing to take risks to help us see where our brand should be. We took the xB's iconic boxy shape and explored something more vivacious, yet just as emotionally appealing. This concept is the sporty version of a box." Tokyo Design developed the Hako Coupe with classic American coupes in mind. The car's geometric profile conveys a powerful stance in a compact and bold package. Its trapezoidal LED headlights lie parallel with a large and aggressive, rectangular upper grille. The lower rectangular grille anchors the front fascia and continues to communicate the Hako's aggressive attitude. Round fog lights, symmetrically placed high on the front bumper, have integrated turn signals. The Hako's silhouette is accentuated by slim, race-car-inspired side mirrors that also feature integrated turn signals. Powerful, flared fenders add dimension and contrast to the concept's boxy shape and smooth surface planes. The Hako concept hugs the road with custom 18-inch deep dish five-spoke wheels and tires with a "Scion" custom tread. The orange driver's seat has a gaming theme. Instrumentation and warning lights cascade from the art inspired instrument panel to the steering wheel. The shifter, located on the center console, resembles a large joystick. On the steering wheel is a simple button to start the engine and a track-ball type control for the Hako's entertainment system located on the passenger dash. The entertainment system consists of two video monitor screens mounted on the dash for radio, video, and music capabilities. Users can upload their videos and music through a Bluetooth® connection. The front passenger controls the system using a large rollerball mounted on the center of the dash. A black seat differentiates the front passenger area. "As you know, polarizing style fits in well with our lineup," said Hollis. "And of course we love a good box. We'll listen to the feedback from this concept to help us determine how our brand could evolve and grow over the next five years."